The Compulsive Reader: Legend Blog Tour with Marie Lu! 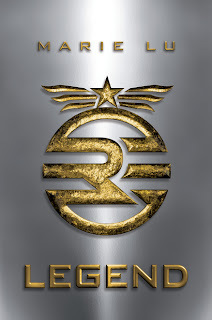 Marie Lu's debut novel, Legend, was released this week! To celebrate, Marie is on the blog today to share her thoughts on...failure. It's an ironic choice of subject, especially since this book has received so much hype (and then there is that recent movie news), but Marie has had more of her fair share of rejection before now, and the fact that she kept going is awesome! It's easy for success stories to be the news we all like to focus on. Seven-figure deal! Four-book deal! Multi-city tour! And so on. But for almost every successful writer, there's a long story of struggle in how s/he managed to get there. And I was no different. So today I'm going to talk about my failures in writing, and all the bumps I hit before I reached a smooth patch of road. When I first started writing seriously (i.e. for the goal of publication), I naively thought that I would finish my manuscript, send out a few letters to literary agencies, get an agent, and then be on my way to getting my manuscript accepted by a big NY publisher. I was in high school. Life was bright, shiny, and optimistic. How hard could it possibly be? Plenty of teenagers get publishing deals, I remember thinking. Christopher Paolini. Amelia Atwater-Rhodes. They were my idols, and I wanted to make it into their small circle. Shouldn’t be too difficult! I didn't even know how to write a proper query letter, but I mailed those letters off to about 30-40 literary agents. The result? Manuscript #1 didn't get a single request for sample chapters. Not a single one. Undaunted, I sent out letters to a dozen more agencies. I got back a dozen additional rejections. At this point I took a step back, flipped through Manuscript #1 again, and tried to be honest with myself. Manuscript #1 simply wasn't ready to be a book. It was full of cliches and meandering plots, weak characters and poor writing. I'd spent a full year writing it, and turning my back on it hurt. But I took a deep breath, put the file away in my archives, and started on Manuscript #2. Manuscript #2 was The Glass Sonata, a fantasy novel some of you might remember. For this one I planned better. I worked hard on a worldbuilding document (a spreadsheet that I used to keep track of the places, countries, customs, and magic in my book), and even made a chapter-by-chapter outline of how the story would go. I'd learned this was a good way to go into writing a novel instead of plunging headlong into it with absolutely no planning. I had high hopes for Manuscript #2. I worked on it with every spare moment I had--setting my alarm for the middle of the night so that I could write quietly for a couple of hours, sneaking moments in after school and during lunch periods, writing on weekends when I should have been studying for my SAT (sorry Mom!). Manuscript #2 had stronger writing, better characters. I thought it would be The One. And for a while, it looked like it might come true. I still got rejections, but I also got requests for sample chapters. While I settled into college life at USC, I got two requests for the entire manuscript--one of them from a leading literary agency that specialized in fantasy/sci-fi. Eagerly I bought a little laser printer and printed out two sets of my four hundred page manuscript. Then I waited. Eureka. Fantasy Agent called one afternoon, eager to sign me and The Glass Sonata. I shrieked. This is going to happen. I now had a venerable agent at my side, and it was only a matter of time before a publisher bought Manuscript #2. What I didn't know was how different it was to get an agent to take on your book, vs. what it takes to get a publisher to buy that book. Months went by. We got a couple of bites, and one request from an editor for revisions. I worked hard on that revision, sent it to my agent, and waited for the publishing contract to arrive. Nope. Silence. A year of silence. As writer Natalie Whipple says, this is the quiet agony of writers who have been signed by agents but haven't had a publisher buy their books. You are now floating in a sort of purgatory, a space where you have no control over what happens to your book. The only thing I could do during this time to keep myself sane was to work on the next manuscript. So I started Manuscript #3. I attended writers' conferences. I tried to hone my craft. Another year passed. Something happened in my personal life that turned everything upside down. I became depressed, bitter, and unreasonably angry at times. I managed to finish Manuscript #3, but all the silent waiting and the personal life drama had taken its toll. Manuscript #3 was weak and unfocused. My agent was obviously not impressed. Months later, after I graduated and got my first job, we parted ways. Catch part two of “A Writer’s Familiarity with Failure” tomorrow at Frenetic Reader! And to enter to win a copy of Legend and a Legend button, fill out the form below! I hope you'll all check out this book! This book sounds so wonderful. I am always interested in how these books come to us. I adore the finished product, but don't envy these authors the heartache attached to trying to get them published. That's quite a painful journey to publishing. I've read articles after articles about rejections experienced by authors and I really admire those who have gone through this journey. It takes grit and determination not to give up. I already bought two copies of this book (one for me and one for my niece) so I'm grateful Marie didn't give up! I so enjoyed reading about Marie's struggles. Because her book got so much hype, we forget the hard journey to get there.